Right away it had me curious, and somewhat wary: hoping I wasn’t going to bump into anyone that matched the personality description on the sign. I needn’t have worried. At the time I visited the Tavern was quiet, but open. 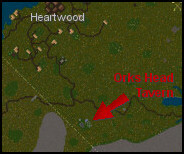 Stepping onto the property, you’ll notice why it’s called the Orks Head. Four heads of Orcs (or Orks, in this case!) lay on the dais by the stairs. A very pretty garden welcomes visitors and some vendors will tote their wares to you if you let them. There were two there at the time I visited, but I hear there will soon be more. 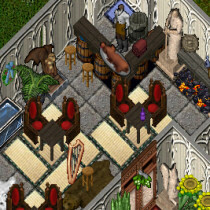 Inside the Tavern it is warm and welcoming. It is clear the regular guests or owners have a love of music, as there is a harp, a lute and a music box here. Uriah, the barkeep, serves food and drink and although I couldn’t get him to talk much, it’s possible I hadn’t found the right words to spark his conversation. If you visit the Orks Head on a chilly evening, as I did, I recommend a bottle of their fine ale (or some freshly steamed vegetables if you don’t drink) and go for the table by the fireplace to warm those cold feet and hands!